Ever Wonder Why Barns Were Traditionally Painted Red? If you’ve been fortunate enough to spend time in the pastoral American countryside, you may have noticed that the vast majority of beautiful old barns you see are red! Have you ever wondered why? You’re not alone. Some say that farmers didn’t want their cows to get lost in the wilderness, so they painted their barns a bright color—but that doesn’t explain why all these barns are the same shade of red! And, we’re fairly certain that cows are red/green colorblind anyway. Well, the actual reason that most American barns are traditionally red is not to make them stand out amongst the greenery of the rural countryside. In fact, according to Live Science, the classic color dates back to the 1700s, just a couple of decades after the first European colonists settled in North America. The first American barns weren’t painted; the colonists would simply build them out of wood and leave them be. That’s probably because paint was expensive, and painting a huge barn that was likely going to need to be repainted again in a few years simply cost too much. However, after leaving their barns unpainted for a while, farmers started to notice that the wood degraded quickly—and replacing wood on a barn was obviously more expensive and labor-intensive that simply painting it. So, the farmers came up with a do-it-yourself solution. 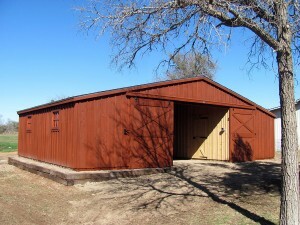 They mixed skimmed milk, lime and red iron oxide to create a red “paint” that they applied to their barns. The recipe became popular since it was inexpensive, and all of the ingredients were readily available. Plus, the farmers realized that the paint not only protected the wood, but it kept the barn slightly warmer in the winter (the dark red color of the paint absorbed sunshine more than the light colored wood). So, all the barns were soon painted red, and the livestock enjoyed a toasty winter season. For information on how to outfit your property with a classically American barn, check out our available barns and contact us at Deer Creek Structures today!